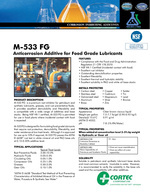 M-533 FG is a premium rust inhibitor for petroleum and synthetic lubricants, greases, and rust preventative fluids. It provides excellent demulsibility and filterability and is compatible with a wide range of additives and base stocks. Being NSF HX-1 certified, M-533 FG is permitted for use in food plants where incidental contact with food is expected.